Aeropostale 70% Off Everything Sale Plus An Extra 30% Off Clearnace! You are here: Home / Great Deals / Aeropostale 70% Off Everything Sale Plus An Extra 30% Off Clearnace! Aeropostale 70% Off Everything Sale Plus An Extra 30% Off! 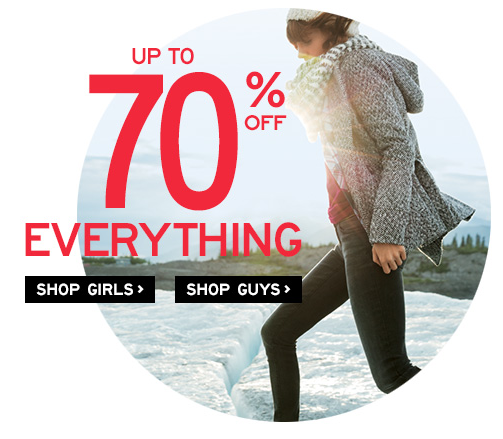 Aeropostale is having a great 70% Off Everything Sale! Just use code: GIFT20 at checkout! You can get $6 Graphic Tee’s, $8 Long Sleeve Tops, $10 Hoodies and tons more! PLUS you can also get an additional 30% off clearance just use code: EXTRA30 at checkout to get yours! PLUS you get FREE shipping with orders over $50!